“Green apricot, lemon, orange blossom. Something good and tart like cream cheese frosting. White pepper, white peach, green mango, kiwi fruit and green apple. The palate has epic bright acidity from the chardonnay, and richness from the viognier. Here the whole is greater than the sum of its parts. Thoroughly enjoyable and textural. Lovely low alcohol at 12.8%. This is a racy little number but fat at the same time. Yes. 94+ Points.” Erin Larkin, 29 May 2018. Our 2017 Viognier Chardonnay Barrel Batch is an unconventional blend – using the most widely planted white varietal in Chardonnay, paired with the least-planted white varietal Viognier. Both full bodied and charming in their individuality, together they form an enchanting wine with bold, but restrained flavours which was treated in a traditional method, and then blended to form a contemporary style. The Viognier creates a weighty, fruit-driven wine with beautiful floral aromas, while the Chardonnay steps in to provide natural acid and focus. 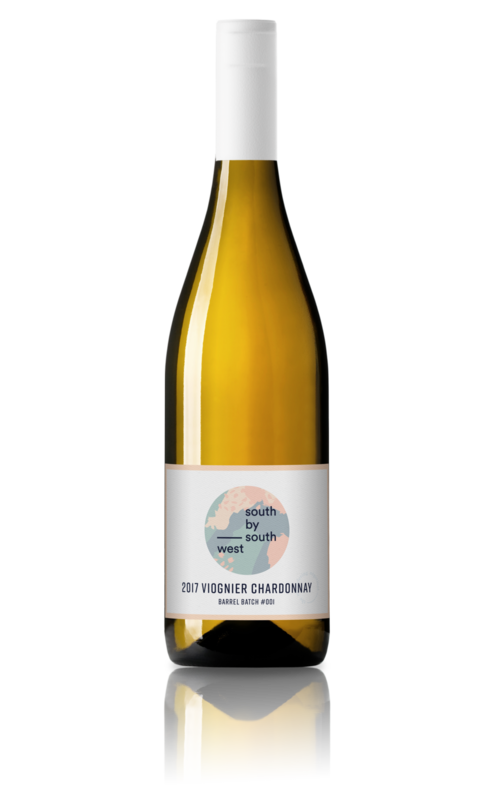 It’s an unconventional blend, our Viognier Chardonnay; arguably the most widely planted white varietal in Chardonnay, paired with the least-planted white varietal, which at one time was close to extinction. Both full bodied, both charming in their individuality, and together they form an enchanting wine with bold, but restrained flavours. This wine is inspired by our travels in the Languedoc region in the South of France. It is about contemporary tradition – two classical varietals, treated in the traditional way, blended to form a contemporary style. The general structure and versatility of Chardonnay is complemented by the floral aromas of the Viognier. We wanted the Viognier to create a weighty, fruit-driven wine. The Chardonnay steps in to provide some natural acid and focus. Together, these varieties form a weighty, balanced, and fruitful full-bodied white wine. This blend reflects the saying, ‘if you never try, you’ll never know’. We are very excited and proud to present this wine as our first in our barrel batch series. We love it, and we are sure you will too. 2017 was a cool vintage of elegant, perhaps slightly lighter bodied wines. For typically full bodied white varietals, this was seen not as concerning, but as an advantage to achieve something different. Both varietals for this blend were sourced from Margaret River. The Burgundian Clone 5 Chardonnay was sourced from sandy loam soils at the Alexanders Vineyard in the Carbunup sub-region on March 3, at 12.4 Baumé. The Viognier fruit was sourced on March 18, from more ironstone soils at the Miamup Vineyard in the Wilyabrup sub region and at a fairly low 11.5 Baumé. Although the sugar levels were on the lower side due to the long, slow summer, the flavour was well developed. The Carbunup Chardonnay was de-stemmed, pressed, inoculated, and went through both a primary and secondary (malolactic) fermentation in charry toasted new French oak. This juice was matured on yeast lees and with regular bâttonage for 6-8 weeks to enhance mouth feel and complexity, then aged for 6 months. The Wilyabrup Viognier was inoculated with the same Burgundian yeast strain in a stainless steel tank and, once the Chardonnay completed the secondary fermentation, blended together in equal portions into a barrel. With a naturally higher sulphur level present in the Viognier, blending the Chardonnay that underwent Malolactic fermentation was a perfect match. In a glass this wine has a mid-straw like colour, with some green hues. The nose has a lot going on in a delightful way. There is white peach, citrus, some melon, ginger, wattle flowers and waxy tones. The Chardonnay tends to be more influential at the beginning and ends on a creamy, savoury note. Meanwhile, the Viognier has a much softer start that builds into a smooth oily feeling on the mid-palate, and finishes on a limey-tangerine note. This blend comes together with restrained lime, white peach and nectarine fruit, and a long dry finish. Together the two provide an extremely complimentary and well integrated wine with brightly balanced acidity and the minerality to match. We aim for minimal intervention to let the fruit express itself, yet there are certain things we do need to maintain the quality and integrity of this wine. We’ve added minimal sulphites to stop the malolactic fermentation, stabilise the wine and ensure its shelf life. It has also been fined with the aid of skim milk products or Isinglass to remove harsh phenolic compounds. We use this method as opposed to other by-products as it is extremely gentle in nature and does not strip flavour nor character from the wine, creating a final, high quality polish. This wine was cold stabilised and filtered prior to bottling. Keep up to date with all the latest from South by South West.